assumptions for one of the methods. The metric used for assessing cost was the surcharge to the average NM household yearly electric bill. In each case the cost per household was found to be on the order of just over one thousand to several thousands of dollars of added expense per year over the full 20 years of the plan. The lowest estimate obtained was $1,500. The high estimate was approximately $6,653. The remaining two estimates were $3,200 and $6,000. Based on the variability of assumptions and range of estimates it isdifficult to assess a true number, but the range somewhere around $5,000 seems to be the best one possible given the vagueries of the proposed plan. Quite frankly, no one has attempted to build a state-wide system capable of delivering 80% of power based on renewables of primarily solar and wind sources. Therefore the estimated costs are highly variable and uncertain. Based on this uncertainty, proceeding with such a plan without a clear path of success based on any other state’s performance would likely involve considerable risk to the taxpayers and citizens of New Mexico. The cost of this plan is believed to be somewhere in the $60+ billion range, which would entail raising government spending by over 25%. This would consequently reduce the state’s ability to attract new businesses to the state. These facts alone signal a level of inattention to detail that is relatively damning for gubernatorial candidate Michelle Lujan Grisham, my opponent, Nathan Small, who proposed a similar goal in Senate Bill 312 of the 2017 NM legislature, and Mimi Stewart and Jeff Steinborn, his cosponsors. It should likewise be highlighted that PRC candidate Steve Fischmann is similarly carrying a torch promising “cheap” renewable power. As shall be discussed, renewables are only cheap if their integration costs are ignored, a perspective that misses a significant portion of the overall cost of renewables. The first part of this paper covers a general discussion of the renewable energy issue. For those interested in just the calculations of cost, please skip the majority of this section except for the rundown of the basic assumptions contained far below in the section entitled “>>> Calculation Caveats.” The calculations are essentially a stand-alone issue, but they are a reflection of the general discussion and the issue of integration that will be a major topic of discussion in this section. I first note that the Grisham Plan (as I call it) was not the first effort to pass into law a bill that would impose an 80% renewables requirement on taxpayers and electric rate payers in the state of New Mexico. This distinction was given to a bill sponsored by my opponent in the District 36 race, Nathan Small, in conjunction with co-sponsors Mimi Stewart and Jeff Steinborn. The legislation Senate Bill 312 was introduced in the 2017 New Mexico legislative session. It also called for increasing the state’s dependence on renewables to 80% by 2040. In reading through this bill it became clear that the authors had placed into the bill certain caveats that would presumably sooth the concerns of rate payers in case the costs of this program became excessive. However, the main people “at the switch” to keep this from happening are named as the members of the state Public Regulatory Commission (PRC), and coincidently the local Democratic candidate for that position is Steve Fischmann, a far-left proponent of renewable energy. Hence, we have a situation of the foxes guarding the henhouse and could easily end up with huge rate increases forced on New Mexico rate payers should the PRC vote to say that the extra costs imposed by renewables are in the public’s best interest. Note the equivocation highlighted here. For the natural gas power he cites a lifetime cost, but for solar and wind he only cites production costs, without accounting for installation and integration costs. It is true that once solar/wind have been fully integrated into the system they are relatively cheap, but they are far from inexpensive because they also entail huge adjustments to other traditional elements of the power grid because the power they supply is not dispatchable, they are only available when the wind blows or the sun shines. The SB 312 bill proposed by Stewart and Small also ignores integration costs. Nor does the word “intermittent” appear anywhere in the Stewart/Small bill, as though this has no impact on the cost or efficiency of renewables. According to Fischmann, renewable power sources are cheap, and therefore any state that adopted higher levels of wind, solar, and hydroelectric power should experience a significant price drop in energy costs. His above claim appears to argue as solar and wind are added, since these sources are half the cost, we should experience a price break on electricity by following the Grisham plan. Fischmann is correct in that solar panels now cost a mere $0.23 per Watt of NamePlate power. In addition we must factor in the cost of the land on which these solar farms are situated. The highest density site I have found is the Desert Sunlight Solar Farm north of Desert Center, CA. It features a solar power density of 1 MW per 7.2 acres. California boasts having produced as much as 4,985 MW of solar power over the course of a single day. Why then are California’s electric costs at least 30% higher than that of El Paso Electric, and up to 350% higher? Above is a recent rate schedule increase for California power. 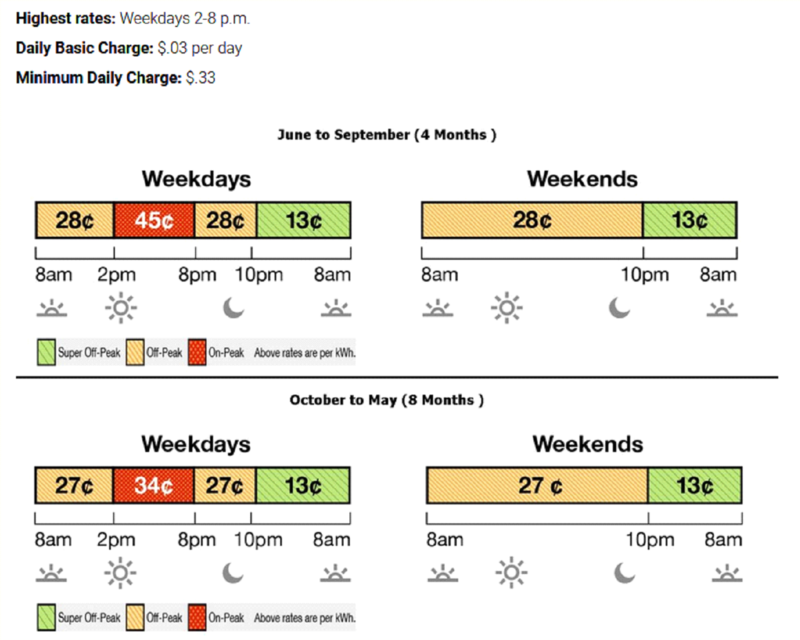 While the price of electricity in California is only 30% higher between 10 PM and 8 AM, this is little comfort to most California rate payers because most of the electricity is used between 8 AM and 10 PM, where they are paying a minimum of 150% more than in New Mexico. Given that solar and wind costs are so cheap, what could account for such increased rates? The answer is integration costs. What has happened is this: Energy experts have produced a method for calculating the cost of energy (called the Levelized Cost of Energy, or LCOE) that is supposed to account for the differences in the means of production. For example, hydroelectric plants may need turbine maintenance and may depend on rainfall upstream, but they do not require any fuel directly to run. On paper, then, solar and wind power appear very cheap because they do not require any fuel. In fact they cost nothing WHEN the skies are clear and the sun is shining or WHEN the wind is blowing. However, because they only produce power at these times, they are not considered DISPATCHABLE power sources. They only produce power when it is available from the sun or wind. Otherwise they produce nothing. The problem arises when an electric system must be powered to the level of user demands 24 / 7. In this case, the system may demand power when the sun and wind are not giving it, and visa versa. In the case of solar power there is a name for this. It is called a Duck Curve, as shown below. 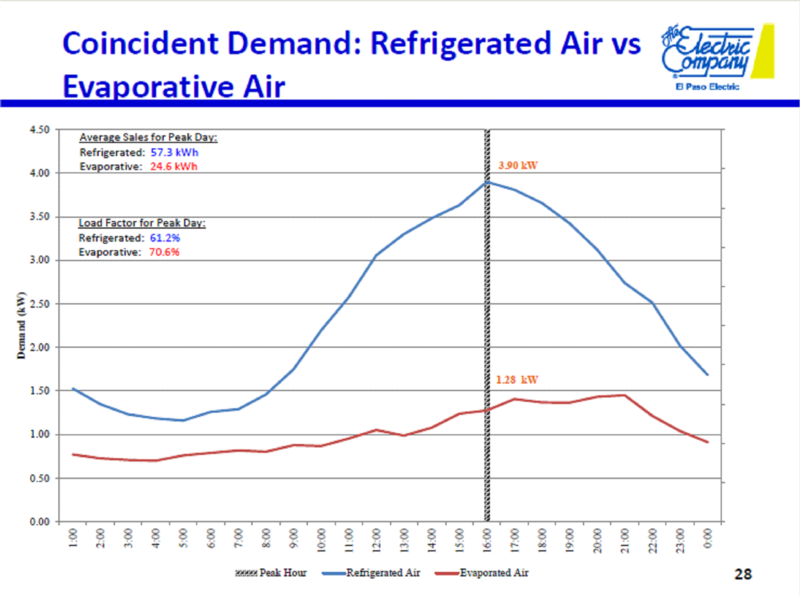 This graph illustrates the problems inherent in a system dependent on solar power without backup batteries. As the amount of solar electric has increased in Hawaii the remaining power system must provide power along the given curves. As more solar appeared, the system needed to ramp up power in the afternoon faster and faster, and also to ramp down other power sources faster in the morning to accommodate the rapidly increasing solar sources. Also note that, as in California, the peak in power comes after the peak of the available solar power. California’s electric rates have been designed to discourage power usage between 2 and 8 PM to reduce this problem. 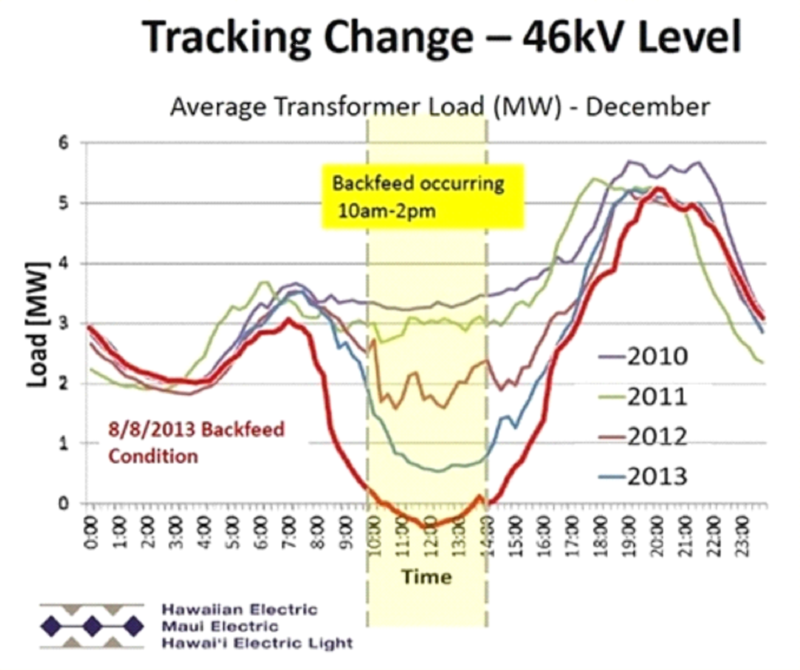 On the 8th of August, 2013, the bottom RED line power curve appeared on Maui. On this day the amount of solar produced exceeded the ability of the rest of the equipment on the network to absorb the energy and a BackFeed condition occurred in which more power is available than the load on the system requires. This would, of course, be the perfect opportunity for charging batteries. 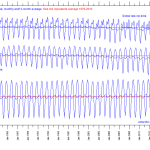 However, in this case, the excess energy flowed backwards into transformer networks and the power control systems on the island and caused electrical system damage. In California, a similar situation has occurred multiple times. However, there, because of connections to neighboring states, the excess power could be shipped to Arizona, Nevada, etc., for a price. Since these neighboring states did not need this power, California had to PAY to have these states TAKE its power away, losing California money. Battery backup would help this situation greatly, but both California and Hawaii appear to be reluctant to pay for this capability, perhaps because they realize the costs would be prohibitive. 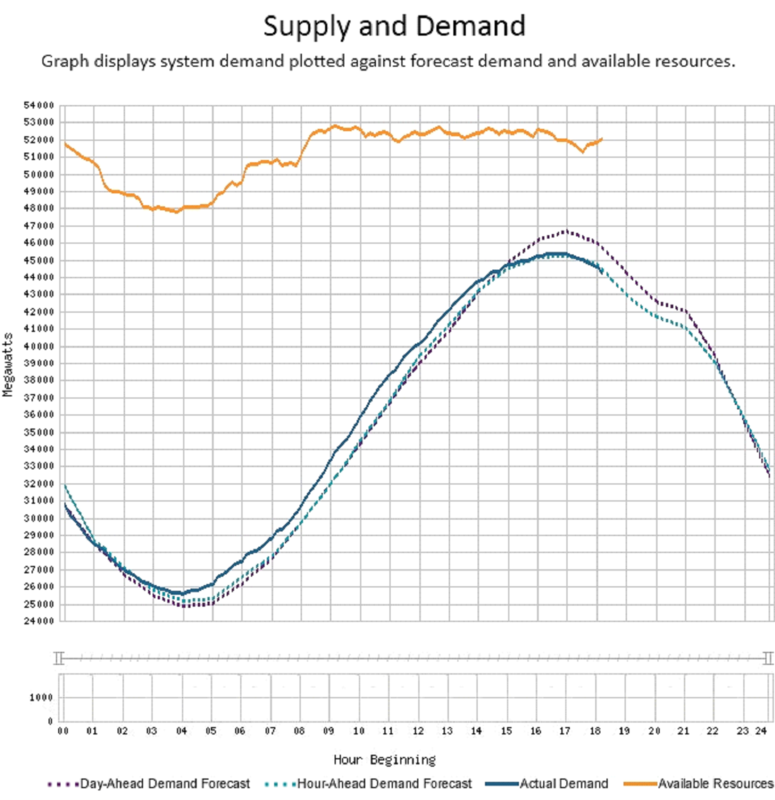 Apparently they have done the math that shows it is easier for them to simply throw away excess solar power and use their base load system at night than it would be to attempt to store this excess energy during the day and reuse it at night. My own back-of-the-envelope calculations based on the $5,900 cost of a Tesla PowerWall-2 with 13.5 kWh (kilo-Watt-hours) of charge would cost New Mexico over $10 billion to install to backup our nighttime power needs. Since we are only 2 million population, California, with over 60 million population would likely need to pay 30 times as much or $300 billion. Clearly this would be a daunting pricetag even for the mighty California, whose state budget for 2016 was $266 billion. Complicating such a plan further would be the added cost of cooling these batteries as they discharge and do a DC/AC energy conversion. It is this ramping up and down of the base-load conventional power system, combined with the excessive costs of a full battery backup system that explains the added costs of renewables. Adding to the complexities of a system that must rapidly react to increasing levels of solar power is a similar situation due to wind energy. 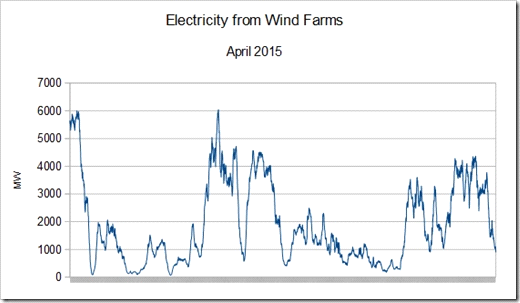 As shown in the figure below which was the wind energy supplied by all wind farms in England in April of 2015, there were several periods running on for days where no appreciable wind power was present. The same situation would apply in New Mexico. For although we have days in spring when the winds can be particularly high, we also experience winds in summer and winter that are very low for days. One must also recall that in New Mexico the size of the state and the remoteness of some regions is such that feeding a proper balance of power to each area would be complicated by a system of wind and solar farms disbursed about the state. Under the current dispatchable power system the sources of energy are highly localized and the fraction of renewables is low. As the fraction of renewables becomes greater the appearance of power sources that randomly turn on and off at different locations becomes ever more complicated and expensive to handle. But we do not need to merely look to California to see examples of the costs incurred by adopting increased numbers of renewables. Denmark and Germany feature the highest priced energy on this graph. They also have invested the most heavily in renewable energy sources, particularly wind. Spain also nearly bankrupted themselves starting in 2007 to adopt a wind-based energy grid. In the process they lost 2.2 regular economy jobs for every new renewable energy job created. This is not the way forward for New Mexico. And again the issue is intermittency. Germany abandoned their nuclear power capabilities to go with renewables, but they found the rated (Name Plate) power on their wind farms and solar farms was nowhere near the actual power supplied by these plants. For example, the California Topaz Solar Farm has a Name-Plate power rating of 550 MW, but on average it only is estimated to produce 23% of this Name-Plate power. To conclude this section, no one has attempted to go much past 30% renewable sources. The Germans and Danes are experiencing tripled electric rates at only 30% renewables. What would happen if New Mexico goes to 80% renewables? While this plan seems to be possible given that California was able to reach 80% renewables usage on 13 May, 2017, this fact is belied by the heavy reliance of the California grid on hydro-electric power from Hoover Dam, Grand Cooley Dam, etc. New Mexico has no such capability. Even though we might have the water to pump uphill during the day in Elephant Butte, there is no such elevated lakebed in which to store this water. The Germans and especially the Danes have similar problems (not a lot of hydro-electric) as New Mexico, and their experience is tripled costs. Having discussed a number of peripheral subjects, we are now ready to attempt an estimate of the cost to New Mexicans of this 80% Renewables Scheme. CAVEAT 1: Solar System Only. 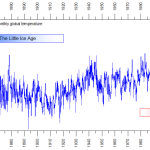 The first caveat is that in these calculations only a solar-based system will be considered. As was illustrated above, wind power can range from nearly zero to full power within periods of only a few hours. Similarly, solar power can range from zero to 100% over short periods, though perhaps not as rapidly as wind. So by considering only a solar system we would essentially be low-balling the cost. It would certainly be higher for a wind-solar or wind-only system, especially if considering the battery backup requirements. CAVEAT 2: Solar Angle and Cloudcover Fractions. Given that only a solar-based system for the renewables is being considered, we may factor in the effects of incidence angle of the radiation and the average cloud cover. Here, we consider only stationary solar panels (not sun-tracking or single-axis tracking) systems. For the daytime incidence angle effect I will use the factor of 2/3rds. Actual integration would result in a factor of pi in the denominator, but this will be close enough. CAVEAT 3: Distribution of Renewables Solution and Power Needs. To optimize the behavior of the solar power system, we will focus the use of the other power sources at “night.” So at 80% renewables, the solar is assumed to handle 100% of daytime needs, but only 60% of nighttime needs. However, because the majority of the power usage still comes at around 6 PM, the needed power usage is assumed to be evenly split between day and night. Also, it should be recalled that in summer, it is often cloudier in the afternoons than in the mornings, so this further skews the available solar power to times when it is not needed. CAVEAT 4: Battery Backup. At night, any renewables power will be assumed to be provided via battery backup supplied by the system. I will assume there is a loss factor in storing power onto and retrieving power from the batteries of a 50% loss factor. While I am sure rather many elaborate arrangements could potentially be divised, any such scheme will carry with it additional loss factors in terms of routing, line losses, transformers, etc. Any real system would require a lot of careful consideration (and design planning and expense) to get it right. This ends the caveats, for now. This result represents a huge increase in electric costs on a yearly basis. 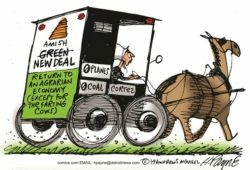 It certainly does not agree well with the promises of cheap renewable energy. However, it also raised additional questions with the methodology used. And it was asked (of myself): Is there some way to verify or further check whether this result is correct or not? Looking back, I also noticed there was something else wrong with the Method 1 calculation: Although I had corrected the number of kilo-Watt-hours a customer normally uses, I realized that New Mexico was venturing into totally unexplored territory. 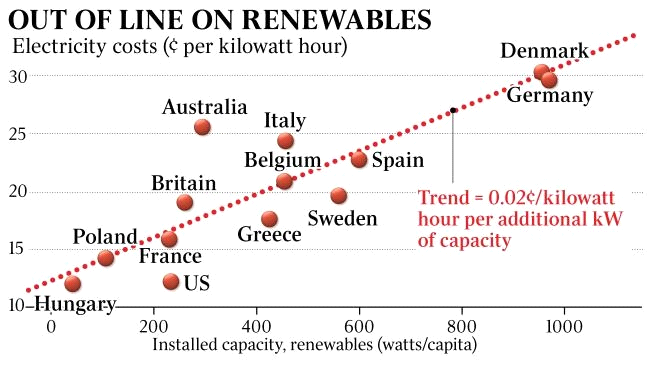 While the curve showing Germany paying triple the cost of other European nations might be right, the Grisham Plan would involve New Mexico increasing our renewable dependence to 80%. So that would involve installing a lot more than 30% renewables as Germany had. So I decided to try to develop an estimate of cost based on how much renewable energy would need to be installed for us to reach 80% dependence and use that number to recompute what the electric rate would be. At https://www.electricchoice.com/blog/electricity-on-average-do-homes/ I found that per capita (per person) electricity usage is 11,052 kWh/year, and that New Mexico sales of electricity are 23.1 billion kWh annually. So now I had two pieces of information, both the total energy usage, but also individual energy requirements. I decided to first see how much the cost of enough solar farms to power the state would be. Based on 23.1 Billion kWh per year, dividing by 365 days per year and by 24 hours per day, I computed an average power usage for the state of 2,636 Mega-Watts of average power. I also had two other pieces of information: Both the Topaz Solar farm and the Desert Sunlight Solar farm in California had cost $2.5 Billion to install and provided 550 Mega-Watts of NamePlate power each. Thus for daytime usage, New Mexico would need to have at least 5 Topaz plants to cover the maximum usage of 2,636 MW at noon. Multiplying this number of Topaz plants by 2 to counteract the solar angle and cloudcover reductions produces around 10 Topaz’s to handle daytime power. At night, one would need a total of 10 Topaz’s to handle 100% of nighttime power needs. However, based on Caveat 3 above, this system need only handle 60% of nighttime needs, so only 6 plants would be needed IFF (if and only if) that power could be directed straight to the users. However, due to Caveat 4 that power needs to be stored first in batteries, which I’ve modeled as being only 50% efficient, meaning you actually need double the number, or 12 Topaz’s. So the total number of Topaz plants needed would be 22. Multiplying this number by $2.5 Billion per farm, the cost becomes $55 Billion!. To this figure we add a modicum of battery backups. I figure this value as $10 Billion extra. The total is then $65 billion spread out over a 20 year period and divided evenly into approximately one million New Mexico households, or about $3,200 per household per year. This number does not count in extra costs for integration of these solar farms into the total power grid. Such added costs of integration are typically not included in most renewables advocates’ calculations. They are simply passed off onto the added costs of running the base-load system that is forced to accommodate the increasing amounts of renewables present. So the true cost is necessarily higher and this value can only be considered a lower bound. What it does do is corroborate our previous thinking that $1,500 per year was too low. Now, perhaps this cost could be divided between certain large users such as the US Government and state and local governments, and other stakeholders. Regardless of manipulations, we are still talking about a cost on the order of several thousands of dollars per New Mexico household. Could the cost be reduced to $1,500 as in the first method? The answer is: Likely not. This second method now gave a number significantly higher than the first method’s value. So a third method was proposed to resolve the difference and see if a further estimate could be drawn that would put this question to rest. 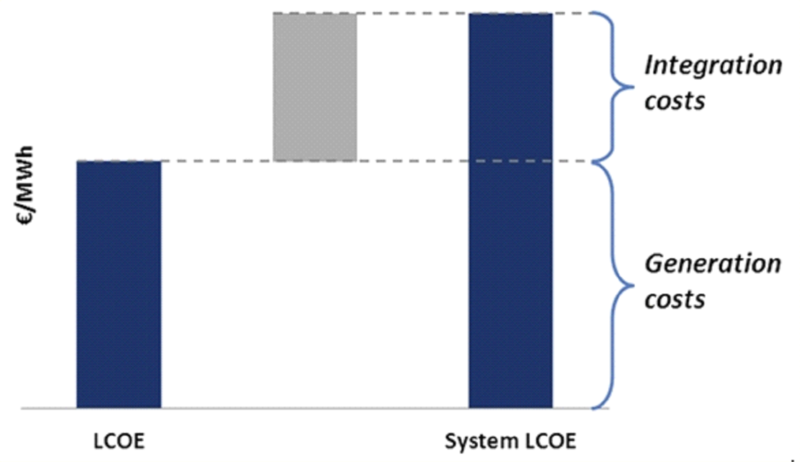 This method involved use (again) of the European experiences and the prediction of costs, but instead of using the cost of 35 cents per kilo-Watt-hour (US), the rate factor of 0.02 cents of cost per Watt of installed capacity per person can be used to estimate the rate when 80% of power is due to renewables. To evaluate this number, let us begin with the quoted value of 11,052 kWh per person per year in New Mexico. Dividing through by 365 days per year and 24 hours per day produced 1.26 kW used per capita, or 1,260 Watts of average consumed power per person. This is not the amount of power used by each person, this is the average power used in the state for all purposes. Also, this is the amount of power that must be supplied, the amount that must be installed to deliver this amount will be considerably greater. And since only solar is being used to supply this 80%, we would only have 12 hours a day (average) in which to collect enough power to supply the 100% of daytime power usage plus 60% of nighttime power. For daytime we multiply 1,260 W by 2 to account for the angle and cloudcover effects, 2,520 W. For the remainder we multiply 2,520 W by 60% for nighttime needs, but then multiply by two to account for the battery storage, so multiply by a net factor of 1.2, or 3,024, and add to 2,520 to get 5,544 W total installed power per person. Multiplying 5,544 W by 0.02 cents per installed Watt, we compute a 111 cent surplus cost based on renewables that is then added to the standard 10 cents per kilo-Watt-hour rate. Multiplying $1.11 extra per kWh times a standard 500 kWh/month usage then yields an added cost of $555/month to an average electric bill, or around $6,600 per year. Since this method is based on the European experience that includes integration issues, this method should include the added cost of infrastructure involved in integrating the system. This electric rate is consistent with both the German and California electric rates, exhibiting the expanded costs when moving from 30% renewables to 80% with a corresponding doubling in electric rate. The extra burden of storing daytime power for use at night rapidly increases the cost of renewables if the dependence level ever exceeds 50%. Of course, California would be able to substitute in hydro-electric power at night to fill in any gaps in other renewables. It is perhaps then even more curious that California should be experiencing such high electric rates even though they have the advantage of plentiful hydro-electric power. Without any sizable sources of hydro-electric power, New Mexico would face the full brunt of having to use battery solutions for nighttime power. Even this $6,600 estimate may not fully reflect the truly devastating impact of intermittencies when high percentages of renewable sources are due to solar and wind. All of which leads to the following observations: Either Michelle Grisham, Nathan Small, Jeff Steinborn, Mimi Stewart, and Steve Fischmann are simply unaware of the extreme costs of their proposals or they are aware. If they are aware of these costs, and they are still proposing them, then they are planning to perpetrate a rather cruel trick on New Mexico voters as they promote so-called cheap energy knowing it will double, triple, or quadruple our electric bills, perhaps raising the cost of a kilo-Watt-hour as high as $1.21. This would point to a type of zealous “true-believer” mentality in these people in that they are willing to sacrifice the future of New Mexico for the sake of this quest that will end up bankrupting our state. Alternatively, they may simply not know, or not realize, or not want to know, how expensive our electric bills will be. This would be gross negligence on their part and should cause voters to pause when considering their other qualifications for office if they would be prepared to lower this incredibly expensive plan, costing well over $60 billion on our state. Either way, we cannot afford to elect people like this who would endanger the future of our state. Before closing, let us look at this another way – from the viewpoint of a business owner who is deciding whether to relocate a portion of his business to our state or to open this portion up in a neighboring state. He looks at our state and sees that his electric rates would triple, quadruple should he choose to open here. Or he can open in a neighboring state and avoid these costs. What would you do? If we adopt this plan it will not make New Mexico’s poor job market better. If anything it will grow worse.